Window valance is an essential way of decorating windows. 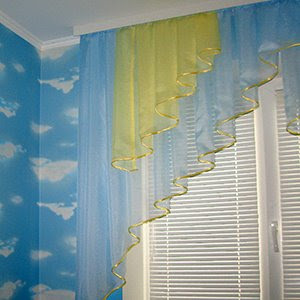 Proper combination of wallpapers and window valances brings sunny and fresh hues to the room and help to create the effect of sunny sky. It can be applied to different kinds of rooms where you need to create an impression of cosiness and warmth. It is wonderful how easy you can combine it with various interior colours - from whitish to dark, from pastel to bright shades. I always have such a hard time trying to get valances made to fit my windows. It's almost impossible to find a place that has fabric I actually like also. Recently, I discovered a new place to get a Window Valance made, Priority Windows, I can always find what I need at a reasonable price!